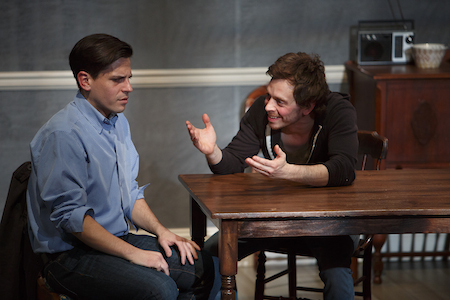 Canadian Stage presents the Toronto premiere of Nina Raine’s award-winning play Tribes. We rely on tribes to build our sense of identity. Liberal or conservative, iPhone or Android, Leafs Nation, Ford Nation, LGBT, metalhead, vegan; these are groups that people use to identify others who share common values. British playwright Nina Raine’s play Tribes is a timely examination of our bent toward tribalism. In our digital/web culture we increasingly segregate into individual tribes; online communities become echo chambers where we seek affirmation for our world views. But does this reliance on tribalism inhibit our ability to actually connect with people? In Tribes we meet Billy (Stephen Drabicki), deaf from birth, he is the youngest sibling in a quirky family. Billy’s father Christopher (Joseph Ziegler) is a sharp-witted but acerbic professor; his mother Beth (Nancy Palk) is a caring but inadvertently neglectful would-be novelist; brother Daniel (Dylan Trowbridge) is a shiftless, schizophrenic grad student; and sister Ruth (Patricia Fagan) an aspiring opera singer. Billy’s parents decided to raise him in the hearing world; nobody in his family can communicate through American Sign Language (ASL). When Billy goes to university he meets Sylvia (Holly Lewis) a young woman who was born to deaf parents and who is slowly going deaf herself. Through Sylvia, Billy learns sign language and discovers a whole Deaf community which leads to conflict when he returns home and finds he has trouble re-integrating into his family. The play includes a fascinating look into Deaf culture and the Deaf community but at its heart, Tribes is a compelling family drama. After seeing the show, it’s easy to see why so many regional theatre companies are clamoring to produce Tribes right now. Nina Raine’s script is brilliant. Though the characters are flawed to the point where they’re almost unlikable, Raine uses them to explore layers of fascinating, complex ideas. The script asks more questions than it answers but the examination of the topics is deeply satisfying. Raine’s razor sharp writing breathes wonderful insight delivered through pithy and often very funny dialogue. The brilliance of Raine’s script is matched by an amazing production. The cast is consistently strong though their accent work is a little patchy and accents tend to fade in and out at times. Joseph Ziegler stands out in the role of the often staggeringly tactless Christopher. Other highlights include the scenes between Billy (Drabicki) and Sylvia (Lewis), and Billy and Dan (Trowbridge) at the end of the play that delivered an emotional climax and release that left me dazed for a good while afterward. I also have to sing the praises of Daryl Cloran for his tight, polished direction as well as the design team; Lorenzo Savoini’s clever set and lighting/projection design combines with Richard Feren’s sound design alternately using projections and soundscapes to draw us into Billy’s world. With its combination of a smart script by a talented young playwright, engaging performances from a strong ensemble cast and an inventive production design Tribes is not to be missed. Shows run Tuesday to Saturday at 8:00 p.m. and Saturday and Sunday at 2:00 p.m. and Wednesday at 1:30 p.m.
Tickets are available in person at the venue box office, by phone at 416-368-3110 or online at canadianstage.com. Photo of Stephen Drabicki and Dylan Trowbridge by David Hou.